It’s almost impossible in today’s super-connected world to not see astronomical events, even when they’re several time zones away. The March 20th total eclipse over the UK and Northern Europe was certainly evidence of that, with video, aerial video, and thousands and thousands of pictures taken (see the gallery on this eclipse’s wikipedia page for a nice summary). 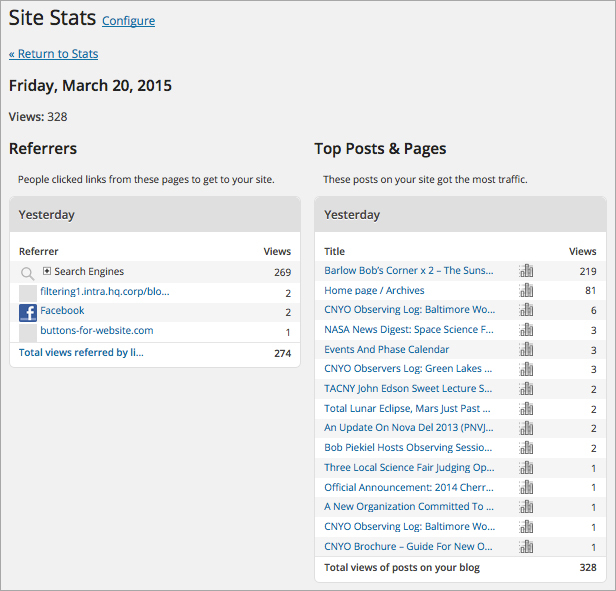 As a fun aside, the visit summary for the last few weeks is shown below, courtesy of our WordPress Jetpack plug-in. As you can see, we’re usually in the 50’s and 60’s every day (mostly directed from search engines). 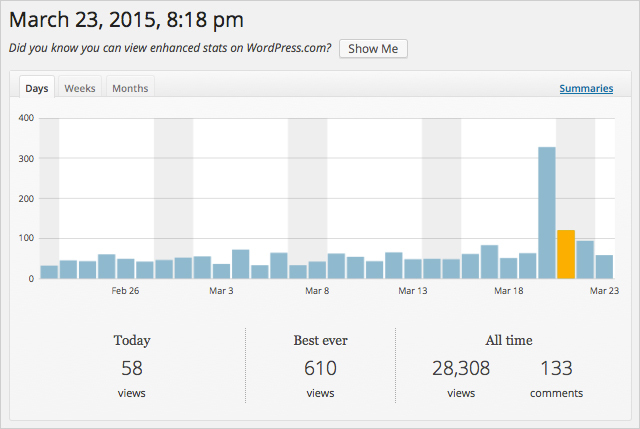 On March 20th, we spiked like gamma ray burst, reaching 328 visitors. A noticeable bump that returned to normal on the 23rd. The large number of visitors (219) all seemed to favor a single page – the late, great Barlow Bob’s two articles on the benefits and use of the Sunspotter. I’ve no idea if the Sunspotter is a big hit in Europe or if people were simply searching frantically for anything solar safety and eclipse-related, but the numbers (for the 20th, anyway), don’t lie. It is my suspicion that many a google’er came across one article or another from Barlow Bob in their solar searches, and we’re happy to have a few of his articles hosted here for others to find as the upcoming eclipses occur. 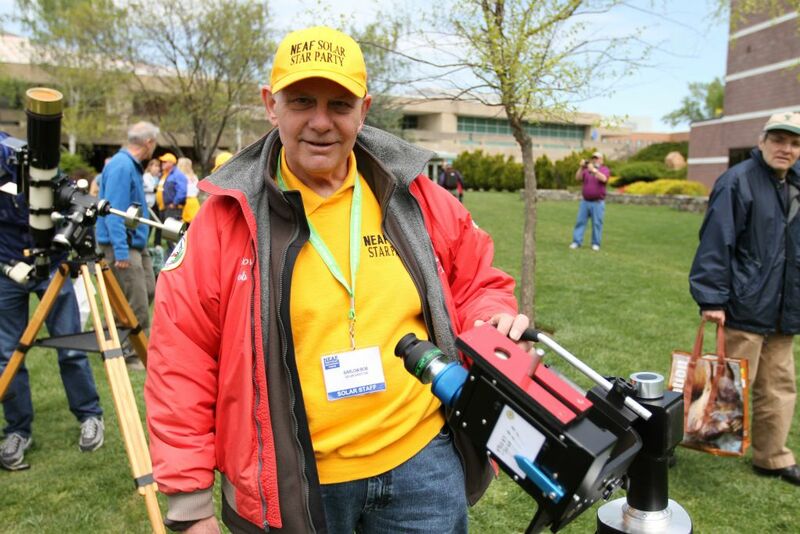 Barlow Bob as captured at NEAF. Image courtesy of stargeezerradio.com. From the “I wouldn’t have ever thought of that” department, and as an even more fun aside, the following image came across my Facebook feed courtesy of Stephen W. Ramsden, the main man behind the great Charlie Bates Solar Astronomy Project. 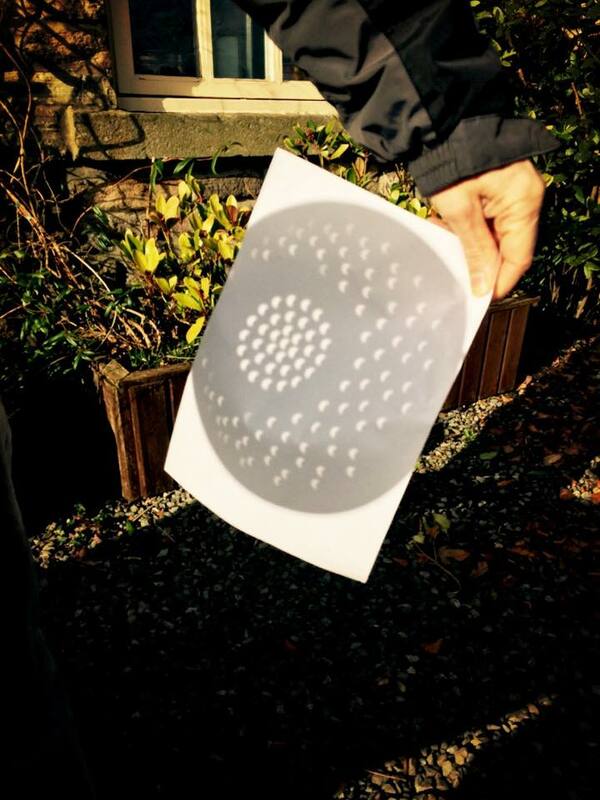 Someone outside of The Feathers Inn in Stocksfield, UK captured the image at right (click the image for a larger view) of the eclipse being projected through a pasta strainer. A capital(-saving) idea! And to show the importance of search terms to google, the searches for “eclipse strainer” and “eclipse colander” produce some very different results favoring the “eclipse colander” (for the purpose highlighted here, anyway). 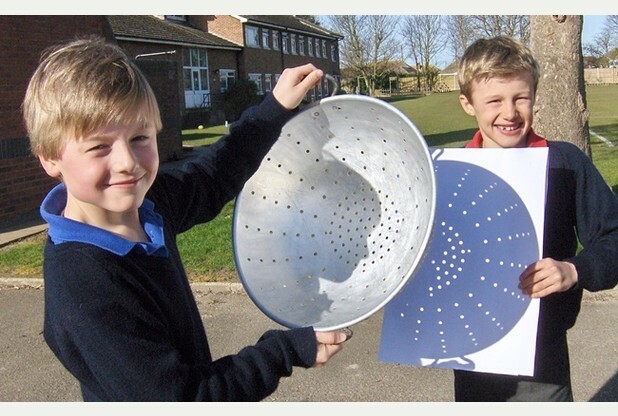 The UK version of the Huffington Post even featured an article for the March eclipse on their site (Solar Eclipse 2015 Sees The Humble Colander Come Into Its Own). I think the kids below explain the procedure simply enough. One can only assume that some seriously ornate eclipse observing will happen if the Moon ever finds itself between the Sun and Tuscany. This all remarks back to a point we cannot stress enough – Solar observing is fun, but definitely not a game! Never-never-never stare directly at the Sun through any kind of magnifying optics! Don’t noodle around if you don’t have proper filters – solar projection is the way to go. Just as Bob Piekiel and Larry Slosberg demonstrate below.